Soundbars are a fantastic way of boosting your TV's sound, especially if your living room is on the smaller side. Not only will a soundbar fit neatly underneath your TV, but if you buy wisely, it'll offer a much improved sonic experience. The latest generation of soundbars can even offer access to high-end technologies like Dolby Atmos, which creates the impression of sound coming from above you as well as behind you (as with a standard surround sound mix). Like anything to do with audio, it's possible to spend a lot of money on a soundbar. You could even end up with a soundbar that costs as much as, if not more, than the TV it's ostensibly acting as an accessory for. But if you choose carefully, you can achieve a marked improvement in sound without breaking the bank. Want more TV audio deals? Find the best TV under £1,000, you couldn't have chosen a better time to shop. Browse through our buying guides for heaps of guidance and the best price deals. More expensive soundbars might offer you more advanced features like Dolby Atmos support or a separate subwoofer, but our choice of the soundbar with the absolute best price-to-performance ratio has to be the Samsung HW-MS650. It has three channels of audio, offers a fantastic amount of bass in spite of its lack of a dedicated subwoofer, and attacks the rest of an audio mix with a similar amount of clarity and control. If you want to expand your setup at a later date then you can even add a pair of wireless rear speakers, the SWA-9000S, to offer a 'true' surround sound experience. It's possible to spend a lot more on a soundbar, and equally you can spend a great deal less, but we think the HW-MS650 is a fantastic buy at this price. Pay a little more for your soundbar, and the possibilities really start to open up with a model like Sony's HT-ST5000. The headline feature here is support for Dolby Atmos. A truly high-end setup would literally use ceiling mounted speakers to create the Atmos effect of sound coming from above you, but since the ST5000 is a self-contained unit it has to be a little smarter. What it does instead is use upward firing speakers to bounce sound off the ceiling and into your ears. It sounds crazy, but the effect is really impressive, and creates a real impression of verticality. Outside of its Atmos support, the ST5000 is a great performer in its own right with a presentation that deftly combines a powerful sound with delicious clarity. On paper, the Dali Kubik One seems like an odd choice for number three in our list of the best soundbars around. It doesn't come with an external subwoofer, it's got a fairly limited two channel speaker configuration (let alone support for Atmos), and it also doesn't support the industry standard HDMI connector. But hook up your equipment with the required optical audio cable and you'll soon see (or rather, hear) what makes the Kubik One so special. It might only support two channels of audio, but it creates such an amazingly spacious sound with them that it's hard to care. It might not have an external subwoofer, but that doesn't stop it from offering ample amounts of well-controlled bass. The audio quality means it's also perfectly possible to enjoy listening to music through the soundbar, which you can do through connecting up a device via Bluetooth. If you want a soundbar that offers raw sound quality rather than an expansive feature-list then the Dali Kubik One is a great choice. If the thought of a stripped down soundbar like the Dali Kubik One appeals but you want something a little more affordable then the Q Acoustics M4 is a great choice. It's a wonderfully compact soundbar that's perfectly content to sit within a TV cabinet, but power it up and you'll discover its fantastic amount of musicality combined with a driver configuration that spreads sound much more widely than its 2.1 channel speaker configuration suggests. 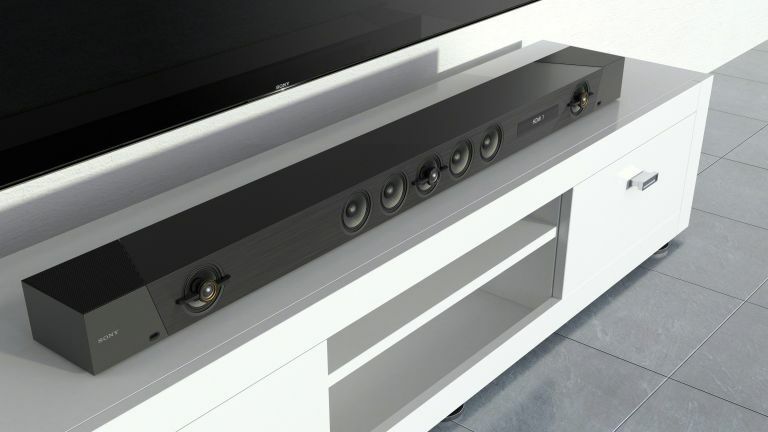 If you want to upgrade the sound at a later date then the soundbar also has a line-out for connecting it to an external subwoofer, although there's no option to add a pair of rear speakers to boost it to a surround sound configuration. Regardless of whether you choose to upgrade it at a later date, the M4 is a fantastic buy at the lower end of the soundbar price spectrum. The speakers attached to your TV will often be the beefiest in your house, so it seems like a shame to only use it when you're watching TV. By integrating the PlayBar into the Sonos ecosystem, you can easily use the soundbar as a capable multi-room speaker in its own right, playing all the same music streaming services that the company has integrated with over the years. But this integration also goes a step further, and allows you to use additional Sonos speakers to build out a very capable 5.1 surround sound system in its own right with the addition of a Sonos Play:1 and a Sonos Sub. Doing so will land you with a system that's much more expensive than many other out-of-the-box 5.1 competitors, but equally you'll be left with a versatile set of speakers that you can rearrange into other configurations as you see fit. All this functionality commands a pretty hefty price premium, but if you want a versatile system then this premium could be entirely justified. Looking for more expert home tech advice?